No cutting, no gluing, just fun! Just peel away precut shapes. Apply fine sand for stunning artwork! 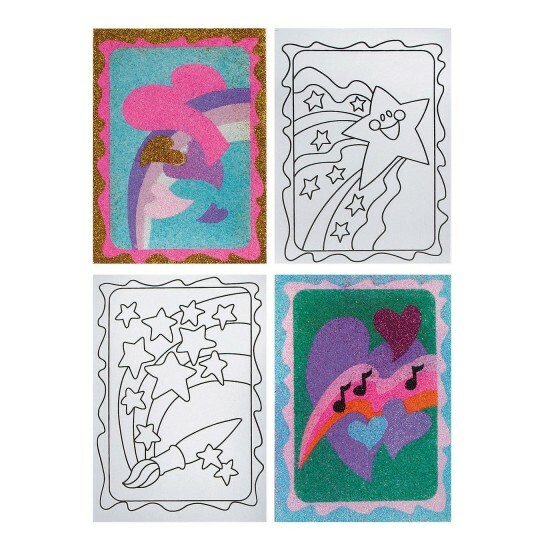 3 each of 4 designs, 12 per pack. 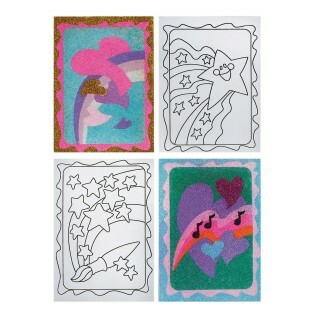 These were great....especially for girls!!! Produces a very nice end product when done carefully. Little kids might need some help but fun for adults too. GReat fun. Remember to buy sand seperately. I work in an outpatient mental health agnecy. Our younger kids love to buy the sand art kits. We always buy three or four kind at a time so they have a good selection. Bought almost every style of sand art boards for the kids as they love them in our summer camps and after school programs. Work well but very hard to get paper off without bending boards. Little kids have a real issue. Even so still popular and will order more.